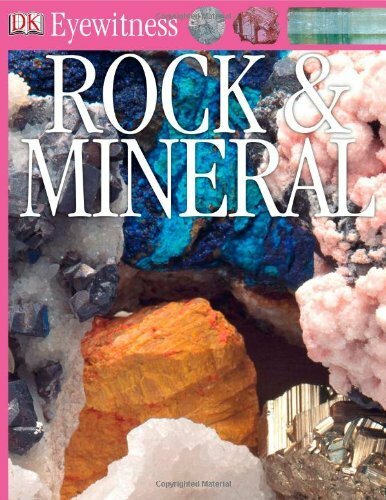 This guide covers over 320 of the most important rocks and minerals found all over the world. 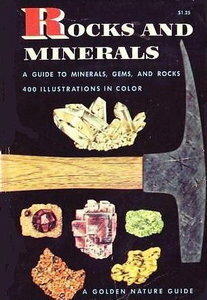 The book begins with a short introduction, which focuses on the process of identifying different rocks and minerals. The following pages divide rocks into three groups: sedimentary, igneous, and metamorphic; and minerals into two groups: ore minerals and rock-forming minerals. Introductions to each of these sections define the groups and explain how entries are organized within them. Every rock you see tells a story about the Earth. Glassy black rocks mark moments when the Earth's liquid insides spilled out onto its surface. Gritty, sandy rocks are the dead skin of the Earth, shed after years of wind and rain. Twisted, sparkly rocks formed deep in the bellies of mountains. 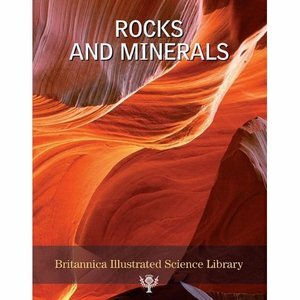 In "Rocks and Minerals", young readers will learn how to read the 'story' of a rock by examining its mineral makeup and how to identify minerals by their color, shape, shine, special powers, and even taste. Students can then use their knowledge of rocks and minerals to understand how the Earth works. This Golden Press edition was continuously in print from 1957 through the 1970's (first from Simon and Schuster, then from Western Publishing). 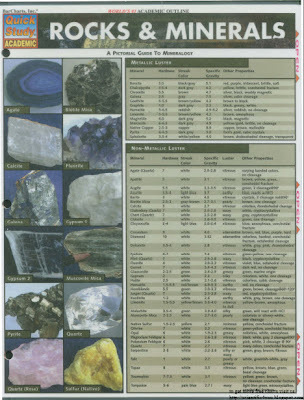 A guide to identifying rocks and minerals, and an explanation of their importance in our daily lives. Lavishly illustrated and clearly written, the Golden Guides were the most popular and revered series of science and nature books for young people ever published, inspiring many a future scientist. Rocks, like airplane flight recorders,store in their interior very useful information about what has happened in the past. Whether forming caves in the middle of mountains, mixed among folds, or lying at the bottom of lakes and oceans, stones are everywhere,and they hold clues to the past. By studying rocks, we can reconstruct the history of the Earth. Even the most insignificant rocks can tell stories about other times, because rocks have been around since the beginning of the universe.They were part of the cloud of dust and gases that revolved around the Sun over four billion years ago. Rocks have been silent witnesses to the cataclysms our planet has experienced. They know the cold of the glacial era, the intense heat of the Earth's interior, and the fury of the oceans. They store much information about how external agents, such as wind, rain, ice, and temperature changes, have been altering the planet's surface for millions of years. Here is a spectacular and informative guide to the amazing world beneath our feet. Stunning color photographs of rocks, fossils, minerals, precious metals, crystals, jewels and gemstones give the reader a unique eyewitness insight into the evolution and composition of the Earth. * See rocks that have come from outer space, stalactites as old as dinosaurs, the strange and beautiful shapes of natural crystals and priceless nuggets of gold, silver and platinum. * Learn what the Earth is made of, how its rocks were formed, how early humans made the first flint tools and how diamonds and precious stones are cut, polished, and made into jewelry. * Discover how prehistoric animals are preserved today as fossils, how volcanoes work, how rocks are formed from molten lava, how minerals and metals are mined and how pebbles on the seashore are worn down into sand, and much, much more.